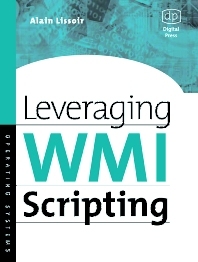 Leveraging WMI Scripting is the second in a series of two books dedicated to WMI. Understanding WMI Scripting (ISBN 1-55558-266-4), Lissoir's first book, explained to Windows Administrators the various WMI scripting techniques and manageability capabilities of this new Windows Server 2003 platform. Illustrated with hundreds of scripts and detailed tables, the book explained the underlying technology and how WMI can be put to work. Lissoir focused not only on WMI programming aspects for developers but on how administrators can use what is available in Windows for their admin work. If you've had significant WMI experience, or have read Lissoir's first book, you are ready to apply your WMI knowledge to any technology that interfaces with WMI. Leveraging WMI Scripting continues the presentation of WMI begun in Understanding WMI Scripting. In this new volume, we dive deeper into WMI to understand the manageable entities of the Windows world. Lissoir offers a structured description of the most important WMI providers available from Windows NT 4.0 to Windows Server 2003 (including Windows 2000 and Windows XP). This covers the WMI management of the Windows Registry, Active Directory, SNMP, the Resultant Set Of Policies (RSOP), and the Volume Shadow Service to name a few. This discussion leverages the information on building real-world scripted management solutions presented in Lissoir's first book. Like the first volume, Leveraging WMI Scripting is based on an important concept: "learning by practice." Leveraging WMI Scripting addresses the most advanced topics so that you can exploit the features of various WMI interfaces to manage the components in a real-world environment. WMI is a critical topic under Windows Server 2003, so this book provides real added value to every Windows administrator. "WMI (Windows Management Instrumentation) is a black hole to many Windows administrators, yet it is a hidden jewel that can be exploited with a little effort to automate and improve common system management tasks. Getting information about WMI scripting, the applications that support WMI, and how to approach bringing it all together to make things happen are some of the reasons why administrators don't use WMI. Alain Lissoir's books cover WMI in depth for Windows 2000 and Windows Server 2003 in a highly approachable manner. "—Tony Redmond, VP and CTO, Hewlett-Packard Consulting and Integration Services. Alain Lissoir is a member of the Technology Leadership Group within HP Consulting and Integration. He works primarily on Directory and Scripting technologies. Alain has delivered Directory Integration workshops and seminars for the Windows Mail & Messaging World-wide Practice. Today, his focus is in the areas of the Active Directory and Windows scripting. He is the author of Windows 2000 Magazine articles about the Active Directory Schema and several other publications about scripting technologies available under Windows 2000/Windows.NET (WSH and ADSI) and Exchange 2000 (WSH, CDOEX, CDOEXM and WMI).